Tags: boxing, Carl Martin Froch, partypoker. partypoker ambassador and former British pro boxer Carl Froch showed the other poker pros that he still has what it takes to knock down his opponents. Carl Martin Froch, a popular super-middleweight pro boxer active from 2002 to 2014 and currently works as a boxing analyst and commentator for Sky Sports, has decided to launch a new career in 2015, and that is, to play poker. A few years later, it sure looks like he's doing pretty well in the poker world. Over the weekend, Froch "The Cobra" emerged as the top winner of partypoker's online Power Series High Roller event, the $530 MTT, to win the first place cash prize of $12,040 and his very first Power Series title. There were 73 other players who participated. Considered a humble amount for a high roller level, still this prize money is worth more than twice the ex-boxer's earnings in the live felt. Becoming an ambassador for partypoker back in 2015, the 41-year-old from Nottingham, UK had accumulated $6,177 plus $5,863 (being the last man standing) as the Power Series High Roller ended. 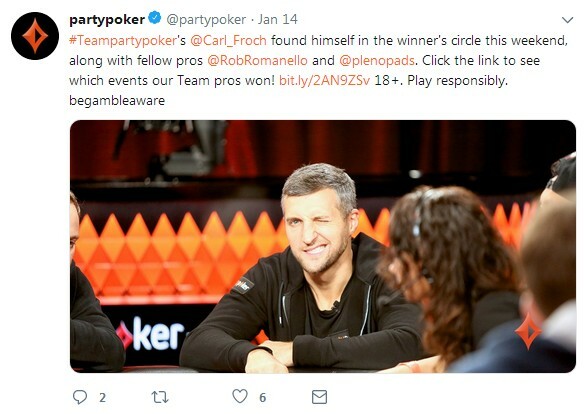 12 comments for "partypoker High Roller event won by Retired Champ Boxer Carl Froch"
I dont think i have ever seen or read before of an ambassador winning a tournament. amount was not "important" for him at all. Maybe you have not seen an Party Poker ambassador who win in a online tournament. The number of players is very small and with good players, but even if Carl Froch was a boxer not a professional poker player, this thing it may happen. I saw in PS more ambassadors who managed to win 1st place in few tournaments and i think one in 888 Poker a woman. They are professionals and they made it. About Carl Froch he did a really good game if he managed to win this tournament. I am really pleased that Carl froch won this event. It shows his true value and worth to the brand and justifies the faith that PartyPoker have placed in him. Well done mr froch. Keep up the good work and keep the trainiñg going so that you may enter and be successful in even more tournaments and inspire more of us to do so. so does this make him a poker pro now?? I doubt too that this makes him a poker professional player. and in boxing you can earn that amount in 1 second! Still, how is this a high roller event if even I could have shell out the buy-in for it?